Note: another one of those posts with 2 recipes so make sure to look at both! My maternal grandmother, Esther Bloch Rosenberg of blessed memory, apparently used to wake up at 5 a.m. on Friday mornings to make challah bread for the Sabbath. Her daughter, my mother of blessed memory, didn’t believe in making challah because she believed (especially after she moved to Jerusalem) that you could buy challah that was much better than what most people baked at home. She was happy to work on fiddly projects for company–just not challah. It’s clear to me that I am not the type to wake up at 5 a.m. but I did want to have a special breakfast recently when we hosted a weekend guest who was in town for my dear friend’s son’s bar mitzvah. 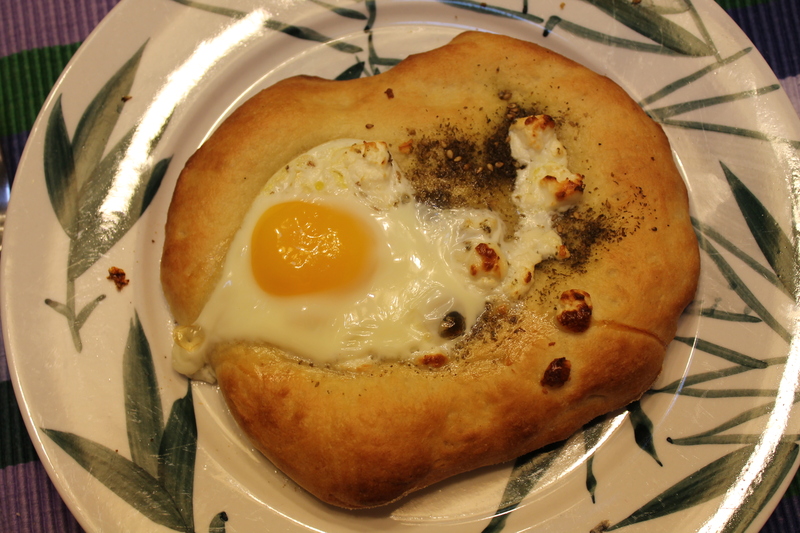 My problem was that the best breakfast item in my repertoire, Sunny-Side-Up Za’atar Pita Pizza (from Joan Nathan’s wonderful The Foods of Israel Today which predates Ottolenghi by more than a decade) would have had me getting up at 5 if I followed the instructions. After all, you have to make dough, let it rise for an hour and then divide it into balls and let them rise for an hour. True confession time: not only am I not willing to wake up at 5 a.m. even for very special company, but I also am not much of an expert on yeast (after all, my mother was against making your own challah). Despite my lack of understanding of the chemical properties of yeast, I decided to experiment. I figured if my mother could have cool-rise challah in the cookbook she wrote in the 1970s, By Special Request, I could try making the dough, letting it rise for an hour, then punching it down and putting balls of dough in baggies and refrigerating them. When I woke up the next morning, I took the balls out of the bags and proceeded with the recipe. I’m not sure if the dough tasted exactly like it does when I’ve made it the way that Joan Nathan instructs, but every one who had the wonderfully fresh dough with a baked egg, za’atar and feta, was very happy. Definitely a great company breakfast you’ll want to try without waking up at 5 a.m. Mix remaining 21/2 teaspoons honey with salt, olive oil and the hot or cold water and set aside. Put the flours and semolina in the bowl of a mixer and with the motor running, slowly pour in the honey-oil mixture and then the dissolved yeast. Process until the dough forms a ball on the blade. If it is too sticky, sprinkle on a little more all-purpose flour. Scrape the dough out of the bowl onto a lightly floured surface and knead it a few times until smooth. Transfer to an oiled bowl, cover and let rise for 1 hour until doubled in bulk. Then punch down the dough and divide it into 4 pieces and roll each into a smooth, tight ball. Put each ball in a baggie or wrap in plastic wrap and refrigerate overnight. In the morning, preheat oven to 500 degrees. Joan Nathan says it’s preferable to have a pizza stone—but I don’t and it comes out great. Oil baking sheets and sprinkle them with semolina. Stretch each ball of dough into a 6-inch circle. It can have bumps—in fact a few small hillocks and valleys work well with the toppings. Put the circles on the baking sheet (or baking stone for you fancy types) and bake for about 3 minutes, until the dough start to dry slightly. Remove the partially baked disks form the oven and brush with olive oil to within 1 inch of the edge—or glug the olive oil on and use a paper towel to spread it. Sprinkle on the za’atar and the feta. Break an egg in the center of each bread (or if you’re feeling indulgent and don’t mind a lower bread to egg ratio—two eggs each pita). Bake in the oven for 5 minutes or until the crusts are golden brown and the eggs are baked. Do not overbake—the pizzas should be slightly soft. I don’t have Grandma Esther’s challah recipe but I remember it as being delicious. She died when I was 9 so while I remember that her food was amazing, I’m not great on the details (well, except for her dobos torte which I do remember). Anyway, her husband, my grandpa Israel Rosenberg of blessed memory, started to bake challah at some point after she passed away since the kneading helped his arthritis or bursitis. I am sorry not to have my grandparents’ recipe since I can remember how good it was. Grandpa sometimes would ship us challah from his home in Texas to ours in Boston. 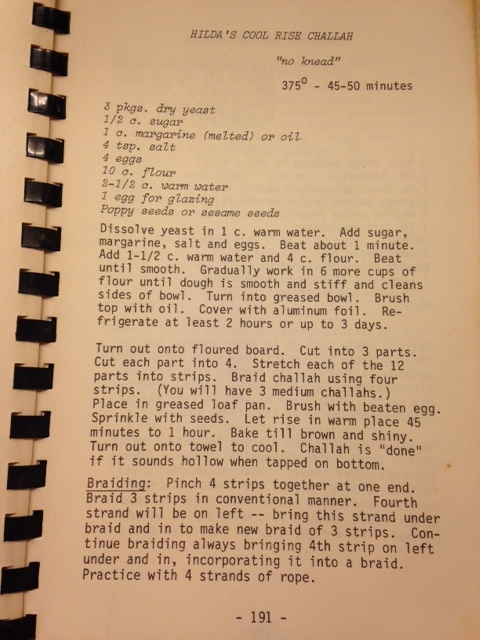 I do have this recipe for cool-rise challah that, like some of the other recipes in By Special Request, is a quintessential 1970s working woman’s recipe (both cool rise and no-knead! )—and it creates a challah with the best texture of all the recipes I’ve tried. I think it’s worth trying—as long as you’re not in Jerusalem, where it really doesn’t make sense to make your own challah considering what you can buy. Dissolve yeast in 1 cup warm water and add sugar. Let sit for a few minutes to foam up and add oil, 4 lightly beaten eggs and 4 cups of flour. Gradually add remaining 6 cups of flour and beat in the mixer with a dough hook until the mixture forms a smooth ball and comes clean off the side of the bowl. Place ball of dough in a greased bowl and cover with more oil and then with aluminium foil. Refrigerate at least 2 hours and no more than 3 days. Turn out onto a floured board. To make 3 large challahs, cut this into 3 pieces. (You could also make rolls and small challahs, but what follows is instructions for 3 large loafs). Cut each section into 4, so that you have 12 and roll this into long strips. You’ll need 4 strips per challah. Here’s the braiding technique—place 3 strips as for a hair braid and then a 4th on the left. Start with a conventional braid the 3 strips and then bring the 4th strip under and braid that strip with the 2 strips that are closest to it. Continue this system, always bringing the left-most strand under and braiding with it. Pinch ends when done and place in a greased loaf pan or on a greased baking sheet. Another favorite way that I learned from mom is to take 3 strands and cover them with the 4 in the other direction so that it bisects the strands. Braid each side and then tuck the braids under and then tuck the cross-section strand underneath . . . and you should have a beautiful round braid. If you’ve added some raisins, it’s perfect for Rosh Hashana. However you’ve assembled your challah, brush them with the beaten final egg, sprinkle with seeds if using and let rest in a warm place for 45 minutes to an hour. Preheat oven to 375 degrees and after the loaves have risen, bake for 45-50 minutes until golden brown and shiny. Challah should have an undercrust and sound hollow when tapped on bottom. Cool on towels or on racks. Believe it or not, we cannot get decent challah in Highland Park, NJ. So I do make it every Friday (but not at 5 am). My mother never baked challah, and my maternal grandmother barely cooked (she grew up with a maid in Russia). I’m a big fan of yeast recipes because my children gobble them up. Okay, Leora, you are allowed to bake challah. Actually, my mother also felt that it was a waste of time when you had other things to make . . . but I think you can handle it. As to the Sunny-side pizza pita, I think you could eliminate the feta since your are lactose intolerant–but I’d leave it on the others since it adds a nice creamy saltiness.